Calendars are meaningful and appreciated. They’re not another direct-mailer stuffed in your customers’ mailboxes or a pushy sales call; in fact, they’re products people pay good money for. When you print calendars to give to your audience, you’re creating gifts they can enjoy. Everyone uses calendars to keep track of important dates and events; and because calendars are useful, your customers will put them on display. Many will reference them daily, exposing them to your company every day of the year. A well-designed calendar helps you connect with customers. Your calendars shouldn’t simply showcase your products and services; they should feature attractive images and illustrations depicting shares interests with your customer base that are also relevant to your business. For example, a mechanic might print calendars that feature hot rods; or, a veterinarian might print calendars featuring cute pets. 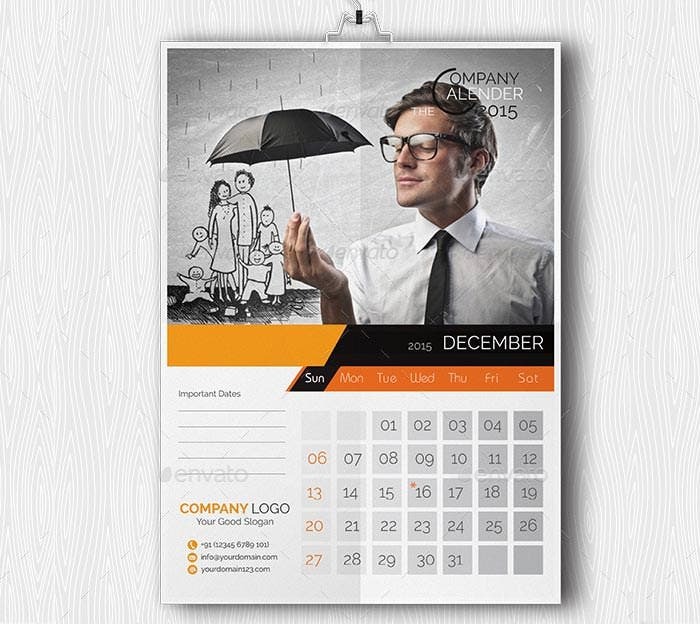 The idea is to lend a sense of solidarity by designing calendars with a theme your customers will appreciate. Because they’re often referenced daily (and sometimes even more), calendars are exceptional branding tools. Your customers should see your business name and logo every time they look at your calendars, so you’re the first company that comes to mind when they need what you sell. Not only are calendars exceptional branding tools, they present opportunities for year-round marketing. Think ahead to offer exclusive seasonal sales, coupons, and coupon codes at strategic times throughout the year. A great calendar design is meant to be shared, and when your customers proudly display your calendars they’ll become conversation pieces. Thus, your calendars will reach your customers plus their peers and colleagues – and word-of-mouth advertising is the best kind. Consider printing stickers representing birthdays, holidays, and special event dates to go with your calendars. Families can have fun placing the stickers on the appropriate dates, making them interactive pieces that further your branding efforts. In addition, you can include QR codes that lead to your website, social media pages, or online videos; or even incorporate virtual reality so customers can learn more about your products and services via their smartphones and tablets. Many companies don’t think about calendar marketing until late November or December, but you can get a head start by issuing calendars early with 18-month calendar printing. You can distribute your calendars in June, and they’ll be good through December of the following year, helping you beat competitors to the punch and ensuring yours are the first calendars adorning your customers’ walls. A good calendar is the complete package, a presentation that represents your business and your relationships with your customers. High-quality photos and illustrations, plus premium calendar printing, exude professionalism; and that means customers will trust you when it’s time to buy. You can send calendars to a targeted audience via direct-mail, hand them to customers at your shop, visit your customers with calendars in-hand, and place them in strategic locations such as restaurants, grocery stores, and other public areas (with permission, of course). If you’re printing a lot of calendars, you might consider partnering with a non-competing company that serves the same audience base. In this manner, you can cut your investment in half yet double your distribution – all you have to do is share half the calendar space with your partner. Business cards, brochures, magnets, posters, and flyers can all easily be delivered with calendars, increasing the number of marketing materials your customers have on-hand, exposing them to more in-depth information about your company, and influencing more follow-up calls and visits. By targeting your audiences, you can maximize your calendar return on investment and minimize your investment. Send calendars to a well-defined mailing list, hand them out to only your best customers, and place them in strategic locations your customers frequent. Do you have special sales days? Participate in community festivals? Host a customer appreciation event? You can print all these on your calendars to draw attention to your own events throughout the year. Make your calendars more interesting by featuring customer stories and case studies, which also work to establish trust and influence your recipients to call on you when they’re ready to buy. Help your customers get what they need – before they know they need it. A mechanic might incorporate a winter-readiness automotive checklist, for example, while a veterinarian might add a pet check-up schedule. Such features are useful to customers, and they keep them coming back for more on a regular schedule. Consider where your target audience is most likely to place their calendars, then print wall calendars or desk calendars – or both! Calendar magnets make handy reference pieces that can feature sports schedules, school schedules, important local phone numbers, service directories, and more – all viewed each time your customers go to the refrigerator. The initial investment required to print calendars might seem greater than some other marketing materials, but consider the cost-per-view. Let’s say you print 1,000 wall calendars at a cost of $2,500. If 1,000 people reference your calendar 365 days per year, that’s 365,000 views at a cost of less than one penny per view! Not even digital marketing can compete with that. Since calendars are so cheap, they deliver outstanding return on investment. All it takes are a few sales to profit from calendar marketing – and if you print a compelling calendar and deliver it to a well-targeted audience, it will yield plenty of sales.